This group may be paraphyletic, with the Coleorrhyncha and Heteroptera derived from within it. See the papers by Campbell et al. (1994, 1995), Sorensen et al. (1995), and von Dohlen and Moran (1995). Campbell, B.C., J.D. Steffen-Campbell, and R.J. Gill. 1994. Evolutionary origin of whiteflies (Hemiptera: Sternorrhyncha: Aleyrodidae) inferred from 18S rDNA sequences. Insect Molecular Biology, 3: 73-88. Campbell, B.C., J.D. Steffen-Campbell, J.T. Sorensen, and R.J. Gill. 1995. 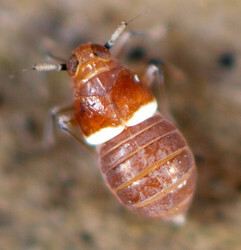 Paraphyly of Homoptera and Auchenorrhyncha inferred from 18S rDNA nucleotide sequences. Systematic Entomology, 20: 175-194. Sorensen, J.T., B.C. Campbell, R.J. Gill and J.D. Steffen-Campbell. 1995. Non-monophyly of Auchenorrhyncha ("Homoptera"), based upon 18S rDNA phylogeny: eco-evolutionary and cladistic implications within pre-heteropterodea Hemiptera (s.l.) and a proposal for new monophyletic suborders. Pan-Pacific Entomologist: 71 (1): 31-60.
von Dohlen, C.D. and N.A. Moran. 1995. Molecular phylogeny of the Homoptera: a paraphyletic taxon. Journal of Molecular Evolution, 41:211-223. Page: Tree of Life Auchenorrhyncha. 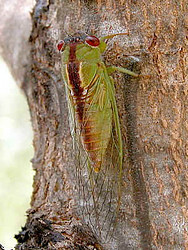 Cicadas, spittlebugs, leafhoppers, treehoppers, and planthoppers. The TEXT of this page is licensed under the Creative Commons Attribution License - Version 3.0. Note that images and other media featured on this page are each governed by their own license, and they may or may not be available for reuse. Click on an image or a media link to access the media data window, which provides the relevant licensing information. For the general terms and conditions of ToL material reuse and redistribution, please see the Tree of Life Copyright Policies.